or on other “Just Giving pages for Children of Fire International" or via our Paypal located at the top right of this page. GreatFire350™ is here! Friday 2nd September 2016. The adapted version of our annual Monopoly Moonwalk sets off from the Bakerloo exit of Elephant and Castle tube station at 9am sharp. From there we will walk along New Kent Road, capture an image at the first Old Kent Road sign we can find and then head along Tower Bridge Road to Long Lane. There we’ll branch left, soon heading diagonally on Bermondsey Street up to Tooley Street. After a short stop for a pastry and fruit at the Brigade bistro, located in the old Tooley Street Fire Station, walkers will continue over London Bridge. Once the other side of the river, they’ll take the second turning right into Monument Street. There the Hydrant is providing the children with alcohol-free Bucks Fizz (Cornish lemonade with orange juice) to toast the re-emergence of the City of London after that fateful day 350 years ago – for 2nd September 1666 was when the Great Fire of London began. Father Phillip of St Magnus the Martyr church and a church warden Edward Haggerwill say a few words along with Bronwen Jones BEM, Founder of Children of Fire. 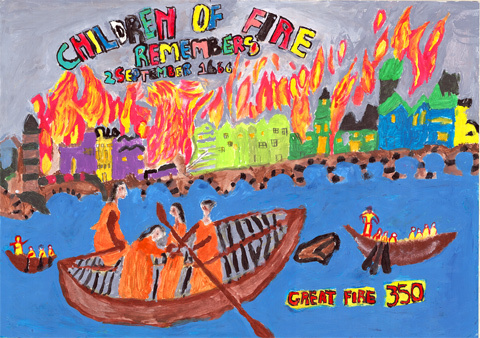 The children will present a painting of the Great Fire to the one of the City’s oldest churches, to keep. They will also give a painting to Heather Smith, a pastoral auxiliary fromSouthwark Cathedral, the other side of London Bridge. This takes place in the City of London’s Ward of Bridge Within and Bridge Without. The choir of Berwin Leighton Paisner, a leading legal firm based at the edge of London Bridge, will sing London’s Burning. And then the children and the general public will join in. They’ll have 100 or more red and yellow balloons to signify the flames of the fire, with the black balloons symbolising the charred remains of the old city and charred former lives.The ancient rondel: London’s Burning stems back to the time of the Great Fire.This spirit of survival against the odds, of revival after the fire, is something that each of our children understands as an individual. We challenge children and schools everywhere to try to imagine the personal renaissance of a burns survivor intertwined with the rebirth of the ancient City of London. When the thoughtful moment at the Monument is complete, our usual walk route will resume. 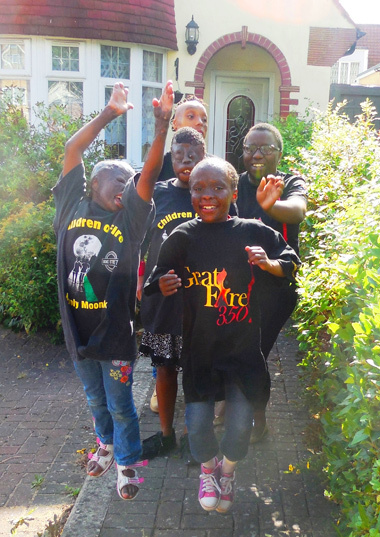 The children and their supporters will set off to Fenchurch Street, Vine Street, Aldgate, Whitechapel and onwards to Liverpool Street, the Angel, Pentonville Road, Euston, Marylebone Station, Park Lane, Mayfair, Piccadilly, Pall Mall, Whitehall, Trafalgar Square, Fleet Street, Bow Street, Leicester Square, Bond Stret, Oxford Street.The end of the walk might be later afternoon or early evening. Walkers include child burns survivors, fire fighters, and a medley of warm-hearted people. We are trying not only to cover the significant costs of arranging reconstructive surgery in the UK for some of our youngest children, but also want to complete funding for an international architectural competition for a paediatric burns hospital to serve sub-Saharan Africa. The walk is about 13 miles (20 km) long. You don’t have to walk the entire route, though the children do. The objective is to take a “selfie” at each Monopoly Game street or other key landmark on the board to prove you were there to your sponsors. Ideally these can be tweeted to @ChildrenOfFire as we walk #MonopolyMoonwalk. Our future ambitions also include – teen burns survivors climbing another volcanic summit in Africa; probably Mt RasDejen in Ethiopia. And another reconstructive surgery outreach to Kinshasa, DRC... (Not because it is easy but because the need is great). Many people have helped us without charge over the years, including some very warm-hearted super-skilled surgeons. But we have to feed, educate and clothe children. We have to arrange travel to where the surgical solutions are. Please help as much as you can. And be safe in your own lives: Test your smoke alarm every week and buy those you love, a fire extinguisher or a Burnshield or both. ONE IN THREE of the children that we help has been burned intentionally. The pain that they have felt is unspeakable. But long after the flames are extinguished, the pain goes on. They are disabled by their burns. But more by your stares. There is no day when they can forget that they are burned. No day when society does not avert its eyes. Or look too long. Brutally. No day when they are not at the receiving end of revulsion. Pity. Cruelty. Tears. Oh for a day Just To Be. So small. So practical. They could astound you. Just to have a thumb and an index finger so that a child could hold a pencil. To have two ears to fix your glasses to. To have a nose to sniff with. To have a prosthetic leg that did not chafe your skin raw. Each child could stand up and shout: “It is not my fault! “My place of birth is not my fault! “My nationality is not my fault! “I am human just like you. “I want to walk, talk, laugh, run, smile, learn, grow, give, just like you. “I am a member of the human race. 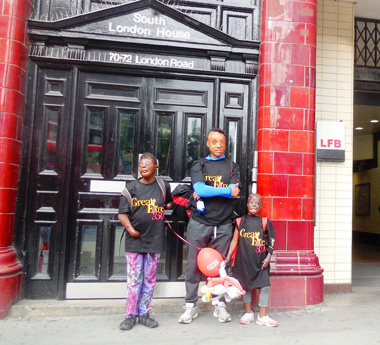 WHY walk 13 miles around London for Africa’s burned children? Or part of the way? Or sponsor a child? There are massive tragedies and atrocities daily in our troubled world. And being burned is one of the most devastating of them all. Children of Fire need your help. Sort Code: 20-17-92 Account: 90103330. If you are walking, please set up a Just Giving Page. We can tell you how.